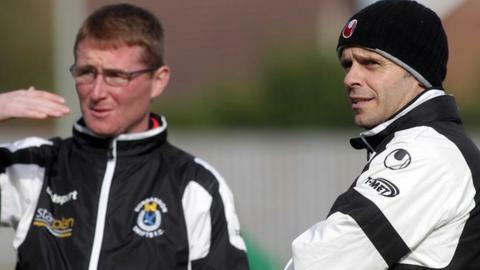 Darren Murphy has been confirmed as the new manager of Dungannon Swifts. Murphy had been working as joint-manager alongside Rodney McAree, who resigned on Tuesday because of personal reasons. McAree quit as sole manager in February as he did not have the required 'A' licence to continue in the job. Murphy himself considered resigning earlier this month but has now decided to take sole charge having held talks with club officials in recent days. Murphy said several weeks ago that he felt "drained" by the post but after holding talks with the club, vice-chairman Jarlath Faloon said that "a meeting of minds" had been reached. The Dungannon official added that criticism directed at Murphy by "sections of the crowd" during a 1-1 draw with Donegal Celtic had led to his comments after the game. McAree replaced Dixie Robinson as Swifts boss last December but had to step down two months later due to his failure to hold the 'A' licence. The Stangmore Park side was beaten 4-1 by Premiership leaders Cliftonville on Saturday and sit in ninth place.